Super chef and caterer from New Zealand, Ruth Pretty, created this intriguing supper dish and recommends accompanying it with a salad and pinot noir. American cooks, please taste as you go; some amounts in this recipe have been translated from the metric system to ours. • Toss mushrooms in olive oil and thyme. Sprinkle generously with salt and pepper and place on a low sided baking tray. Place in oven and roast for 8-10 minutes until mushrooms are soft and juicy. Drain the cooking juices (discard or save for another use) and cool mushrooms. Taste for seasoning. • Very lightly sprinkle flour onto pastry bench and roll out pastry to a 18-20-inch round. Place round onto a low sided baking tray and place into refrigerator for at least 30 minutes. • Place cream cheese, Parmesan, egg, lemon juice, zest and spring onions into a bowl and using a wooden spoon combine. Add salt and pepper to taste. • Spread cream cheese mixture onto the center of the pastry round leaving an 3/8-inch border. Pile roasted mushrooms on top of the cream cheese mixture. • Place egg white in a bowl and loosen with a fork. 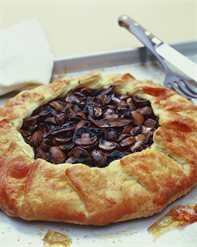 Brush egg white around pastry border and fold pastry, pleating as you go, to partially cover the mushrooms. • Rest pie for 30 minutes in the refrigerator, or overnight. • Whisk the egg yolk with a tablespoon of water to make an egg wash. Brush outside of the galette with egg wash and bake for 25-30 minutes until cooked and golden brown. • Serve hot, warm or cold. If you wish garnish with shaved Parmesan.